When you start finding cat litter in your kitchen, your living room, and even in your bed, it may be time to look into non-tracking cat litters. Although no litter can be completely non-tracking, there are some that are far better than others. We’re going to go over some of the best non-tracking and low-tracking cat litters on the market today. 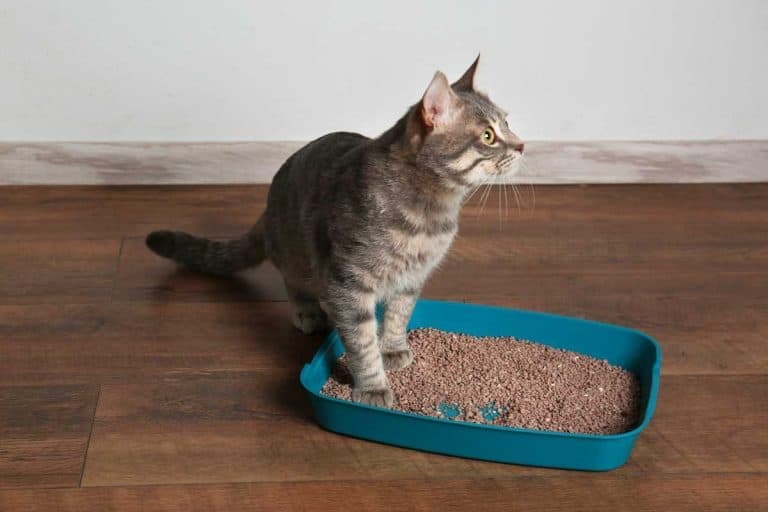 Before that, we’re going to take a quick look at what makes these litters ideal for cat owners that don’t like to find litter anywhere but the litter box. Keep reading to find out more about how one of these low-tracking litter options can help you. What Makes a Litter Non-Tracking? For the most part, litter is tracked when it attaches itself to your cat’s paw or furs and falls off in another part of the home. There are three basic qualities that non-tracking litters have which can keep them from sticking to your cat. If you have a cat that intentionally scatters litter, be sure to check our post with litter tracking prevention tips where you can find plenty of helpful hints to keeping your litter problem under control. Heavier litters are less likely to be tracked through your home than lightweight ones. This is because the granules fall off your cat’s paws as they lift them. So, if you have a choice between a lightweight or regular weight cat litter, stick with the regular formula. Small granules can more easily hide in between your cat’s toes or on their fur. For that reason, you want to look for cat litter that has larger granules. As you’ll see on our list, many of the best non-tracking cat litters are pellets. This is because of their large size that easily falls from your cat. When your cat uses the litter box, some of the litter is going to get wet from urine. 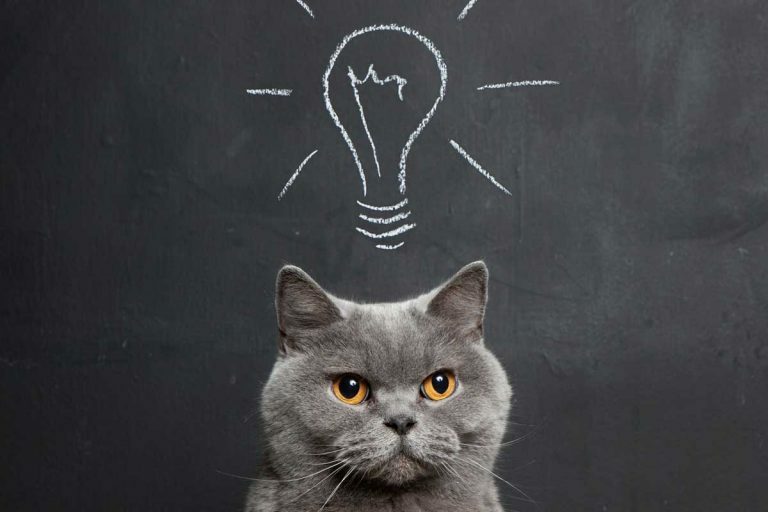 Certain materials are going to be sticker when wet which makes them more likely to move with your cat instead of falling back into the litter box. If the new non-tracking litter you’re considering is about the same as what you’ve already had for your cat, you may not need to do much to transition him. You may also be among the lucky few with a non-picky cat who will immediately use a new litter. However, the majority of people will need to slowly transition their cats to the new non-tracking litter. The first thing you want to do is add some of the non-tracking litter to the top of your cat’s regular litter. Just ½ an inch will be more than enough. This forces your cat to interact with it to get to their usual substrate. After that, every time you need to top off your litter box, do it with the new litter so you’re only adding a little bit of time. If you completely clean out your litter box during this process, try to replicate the proportions that were in there before you dumped it. Once your cat has been using a higher proportion of the new litter for a while, you can go ahead and fully switch them over to a non-tracking litter. If at any point your cat starts refusing to use the litter box, go back to step one and start the transition over again, moving more slowly this time. Be patient with your cat, especially if she’s older. Most cats don’t like any changes. You may find that the new litter is too different and your cat refuses to use it. In that case, you’ll want to look for another non-tracking cat litter which is more similar in texture, smell, and size to what they’re used to. Now, let’s get into that list of the best non-tracking cat litters. 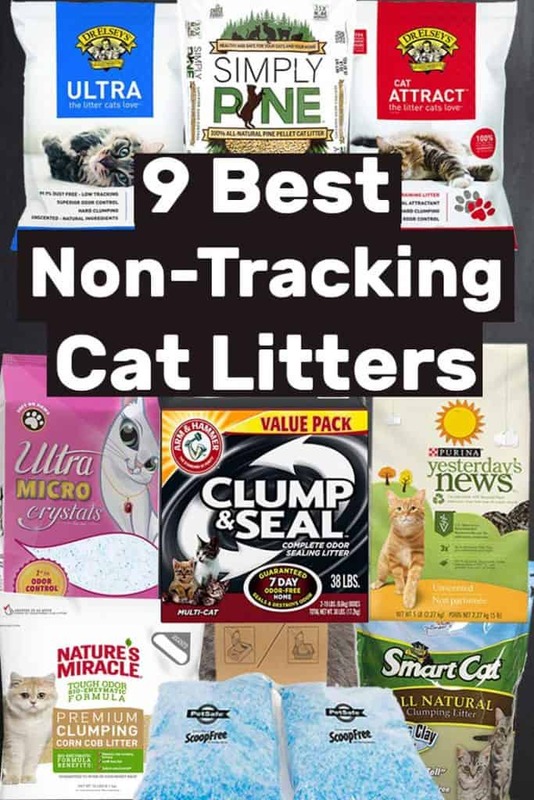 If you prefer a clumping, clay-based cat litter, then these non-tracking litter options are for you. Keep in mind that while there are some advantages to clay litter, there are also some drawbacks to consider, such as its negative impact on the environment. Because this formula is dust-free and fast clumping, Dr. Elsey’s Ultra Premium cat litter is a low-tracking clay cat litter that many cats and owners love. Another formula by the same company, this clay litter has added natural herbs that will encourage your cat to scratch and use the litter box. 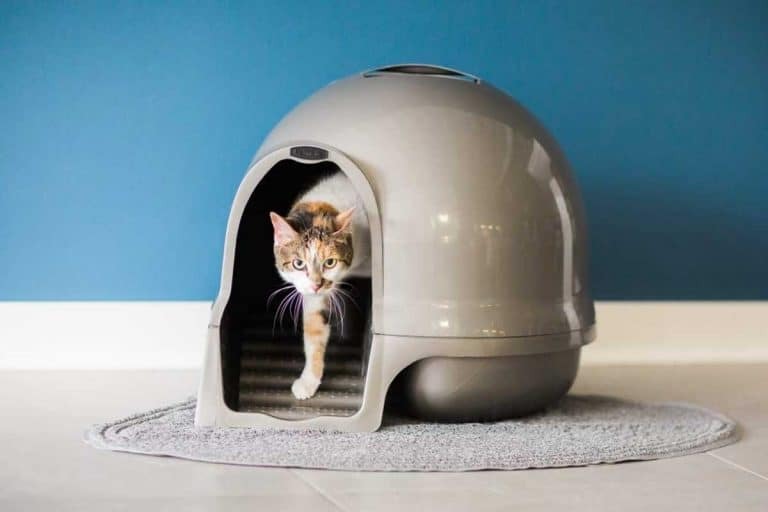 It’s perfect for picky cats or when you’re training a kitten to use the litter box for the first time. Like his other formula, Dr. Elsey’s Cat Attract is considered non-tracking, though the added herbs may encourage extra interest in the box that can lead to over-enthusiastic digging. The last non-tracking clay litter we’re going to go over is made by a company known for cleaning products. With the addition of baking soda, this litter is designed to keep your home free from odors for up to seven days. Because of its fast clumping action, Arm & Hammer Clump & Seal keeps wet litter contained so it doesn’t end up getting stuck to your cat’s paw or fur. We recommend choosing from one of these biodegradable cat litters. They’re better for your cat and for the environment. They’re made with sustainable resources, many using waste materials that would have been thrown out otherwise. Not all biodegradable cat litters are non-tracking so we picked out a few that are for you to consider. As you may have guessed by the name, this cat litter is made from recycled newspapers and other paper. Although it doesn’t clump, it’s 3 times more absorbent than clay and you can add baking soda to help control odors. Yesterday’s News Unscented Paper Litter is made up of pellets which are too large for your cat to easily track around the house. It’s also perfect for cats that have wheat or other allergies that can be provoked by plant-based litters. If you’re looking for a biodegradable litter that’s also clumping, this is a great option. It clumps even better than clay litters, which is part of what allows it to be low-tracking. The naturally-occurring gluten in grass seeds is what allows SmartCat All Natural Clumping Litter to clump so well, and control odors. It’s also dust-free so the litter stays in the box. This is another pellet cat litter that’s low-tracking because the large granules won’t stick to your cat. It also keeps your litter box smelling like fresh pine instead of a litter box. If you’re looking for a great smelling, non-tracking, biodegradable litter, Simply Pine cat litter certainly fits the bill. The only drawback is that it’s not clumping so you will have to clean out the whole box slightly more often than other types of litter. Corn cobs are normally thrown out since they’re not useful for much. But, by turning them into cat litter, they get a second life. The benefit to you is it’s an all-natural clumping cat litter with “tough odor” control. For fast clumping action that helps keep litter contained, Nature’s Miracle Corn Cob Litter is a great option for many cat owners. It can also absorb twice as much liquid as clay litter, allowing you to use less and save more money. The last two non-tracking litters on our list are considered crystal litters. They’re made of silica, a compound that’s found in quartz, sand, and glass. In cat litter, this compound is formed into small crystals which can absorb up to 5 times as much liquid as clay litters. Because they rapidly absorb liquid, odor from urine is trapped immediately, and solid waste is quickly dried out. Although designed specifically to work with the PetSafe self-cleaning litter system, you can use this crystal cat litter in any litter box. If you do use it with the system, the bags are already portioned out to fit. Otherwise, you can just add the right amount to your cat’s pan. PetSafe ScoopFree Premium is a great non-tracking option with incredible odor control. One bag can last one cat up to one month before it needs to be replaced, so its higher price tag may be worth it. If your cat prefers smaller granules, you may want to use this cat litter. The fine granules resemble sand, which many cats love. Despite the small granule size, they’re rarely tracked through the house. Ultra Pet Micro Crystals will help any cat who prefers soft litter and owners that hate dealing with litter box odors. It’s also easy on the wallet since one bag can last a month for a single cat. Need More Litter Tracking Prevention Help? Now you know X of the best non-tracking cat litters, broken down by category. As you can see, there are plenty of options so you can find one that works for both you and your cat. If you’re still worried about having litter tracked around your home, don’t forget to check out our post with 16 tracking prevention tips for cat owners. You’re sure to find at least one that will solve your problem!